Plate 21 from the first set of Thomas Daniell's 'Oriental Scenery.' 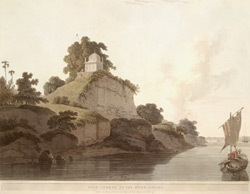 Travelling on their pinnace along the river Ganges, the artists sketched many views and noticed, 'The banks of the Ganges are here very lofty, steep, and picturesque; but are subject to considerable alterations in the rainy season, as the river then rises to the height of thirty feet.' At that time, before the coming of railways, boats like the one in this view with a big sail were widely used for transport. It was the Daniells' baggage boat, and their palanquins can be seen lashed to the roof. Their own pinnace budgerow is in the distance. The actual site of the view is Naubasta, below the ancient city of Kara on the Ganges, with a small 18th century temple crowning the bluff.